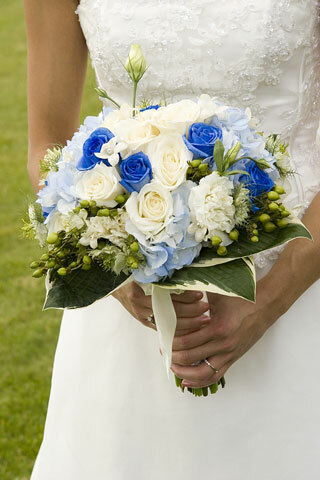 Blue and white roses are gathered together in a beautiful hand-tied bouquet. Smaller flowers fill in around the edge. Surrounding the base of the bouquet are variegated hosta leaves. Hand-tied bouquets are often bound with ribbon that is pinned in place and tied into a bow.